Robot Rickshaw has a new cd! Featuring live human-robot improvisations with monster drummer Steve Snider. Featured robots include AMI, CARI, MADI, and the vocal robot Stemmetje. Get it now, pay what you want! Feeding of hungry robots is encouraged, as always. Limited numbers of physical copies available at shows and upon request. 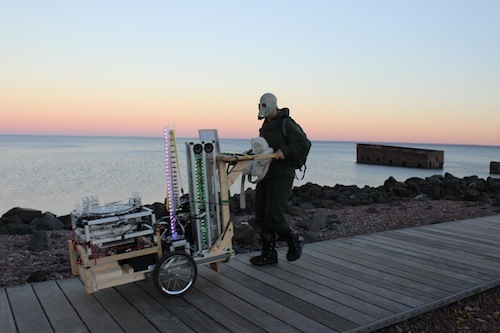 Robot Rickshaw is a rapidly-deployable, human-driven, two wheeled cart full of robots that play music. Piloted by a lunatic in a hazmat suit+teddy bear. 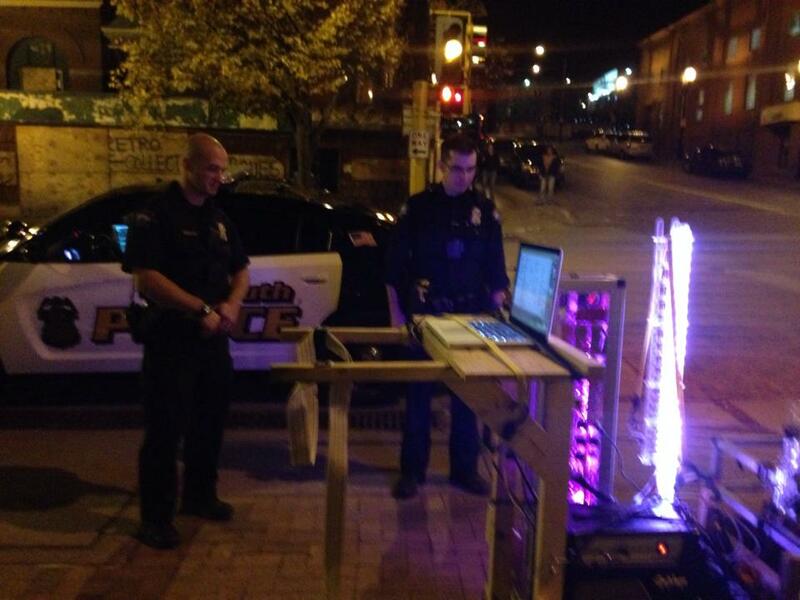 Very popular for festivals, children’s parties, funeral processions, and more! To book Robot Rickshaw today, contact: troy |[(AT)]| expressivemachines \|d0t|/ com. 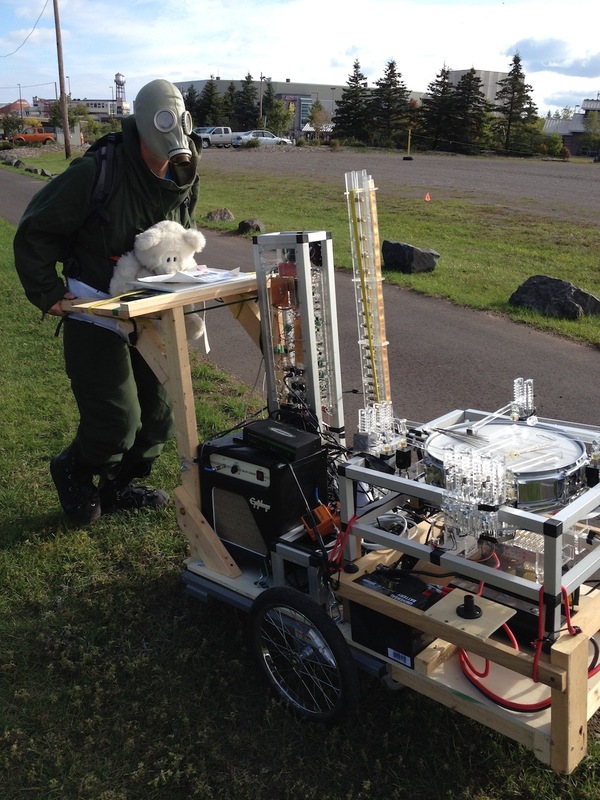 Have you encountered Robot Rickshaw in the wild? 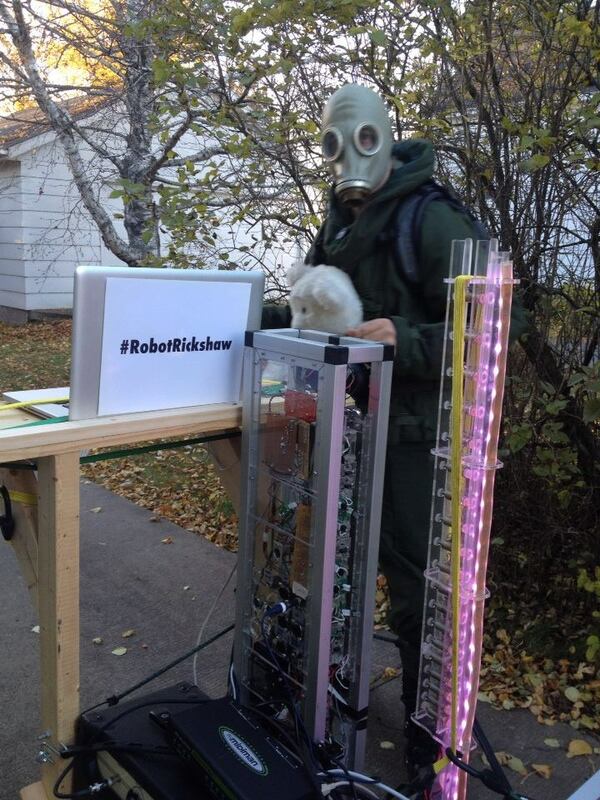 Share your experience using #RobotRickshaw. Constructed from an old bike trailer made to transport children, the rickshaw was originally intended to be pulled behind a bicycle on a trans-American pedal-powered mobile robot tour. Given the weight and power requirements of the robotic musical instruments, this idea was put on hold in favor of getting the robots out for more frequent bursts of fresh air to improve band morale. The rickshaw was first equipped with three robotic musical instruments constructed by Expressive Machines Musical Instruments: the robotic string instrument AMI (Automatic Monochord instrument), the clarinet-like robotic instrument CARI (Cylindrical Aerophone Robotic Instrument), and the robotic snare drum MADI (Multi-mallet Automatic Drumming Instrument). Leading up to 2015’s West Coast tour, MADI was replaced with a newer robotic snare drum instrument, a component of VADI (Various Automatic Drumming Instruments). For Drone Not Drones, the vocal robot Stemmetje replaced the typical snare drumming robot.